Cube Challenge Activity: Our games are based on challenges preformed on tv3s “The Cube” but with the twist that they are played on a head to head basis. Each player has 2 attempts at each game. 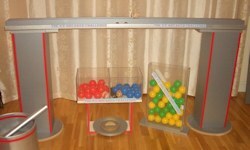 We have 5 games, “Post It”, “Switch”, “Square Tower Move”, “Round Tower Build” and “Ball Stack”.